A New Beginning jumps right into things by introducing some new characters – though one never really knows how long they’ll last in this comic series. Thankfully for this group, they’re saved by Jesus, Rosita, Eugene, and several other heroes on horseback…except it turns out that these ‘heroes’ led the horde of zombies right into the newcomers. That said, I thought it was a bit silly how much Rosita was beating herself up over having done so – it’s clear that some time has passed and that it’s been a while since they found new people, and they were just trying to lead the horde away from their three communities – Alexandria, The Hilltop, and The Kingdom. That’s right, I said three communities. Just as Rick promised Negan in the end of All Out War (Part Two), the “good” people are rebuilding. They’ve set up a barter system and scheduled patrols of the main paths between their settlements; they’re farming and transplanting fruit trees, building mills and training people in skilled jobs. Meanwhile, a lot has changed for the main characters as well. Carl has grown up a lot, though now he’s more annoying teenager than annoying child. Rick still walks with a cane thanks to Negan snapping his leg, but he’s got a hook attachment for his arm. He and Andrea are still together, but they’ve reached a point where Carl is referring to her as “Mom”. Yet through all this, it’s still unclear how much time has passed since the end of the Negan War. The best marker is probably Maggie’s son Hershel; she was still pregnant at the end of Volume 21, and now the boy is speaking – at least minimally – so I think it’s safe to say that at least a year has passed. The problem is, I don’t think readers should have had to wait to see ‘baby’ Hershel before even being able to figure that out on their own. Perhaps outright saying “One year later…” was unnecessary, but there should have been better markers, earlier on. 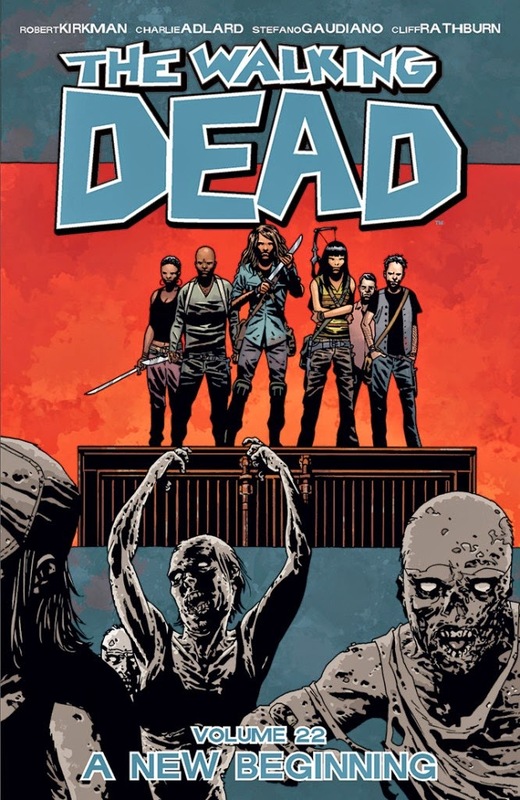 It’s been a while since Carl’s storyline was quite this frustrating, but now that Rick has allowed him to move to The Hilltop to work with the blacksmith, I’m hoping that we’ll see some changes in Volume 23. The fact that Carl was visiting Negan and telling him things that he obviously wasn’t telling Rick was a bit too contrived, and I have a bad feeling it’s going to come back to haunt him. Negan may be locked away, and the new group – Magna and crew – may not have believed his lies, but it’s never a good thing when a Big Bad is still alive at this point. Especially when the writers really wore that story down to its bare bones. Speaking of the new group, they seemed okay at first, but it was still a bit predictable that they almost immediately started causing trouble. Of course the goal of the comics is to keep people reading, and that’s one of the downfalls of reading the volumes – with so many issues published in one book, readers don’t really get a break from the constant developments. One interesting thing to note, though, is that Magna and the others were on the road for seven months and claimed not to have seen another living human in all that time. I suppose when one takes that into account, it’s a bit easier to understand how they think Alexandria – and Rick Grimes – are too good to be true. However, I think they’re a bit in over their heads, ‘capturing’ Andrea for questioning like they did…especially after the panels where Rick and Carl had to fight zombies on a supposedly clear road, leading to a beating via cane when the patrolman responsible showed up. Rick may be healing physically, but there are clearly plenty of underlying issues with him, and I think it’s safe to say that Magna doesn’t want to be on his bad side. There are other problems afoot, as well. At the moment the rebellious kids at The Hilltop (although it seems that only the other kids are aware of the situation) seem to be less important than Hilltop resident Marco’s tale of “whispering” zombies, especially when it turns out that he was right, in a way. Maggie is the leader at this community, and when Marco returned alone she sent some of her best men out to find his co-patrolman Ken, whom he’d left behind. What these men found definitely eclipses the fact that Magna doesn’t trust Rick and that Sophia is having to fight troublesome teenage boys – because The Walking Dead brought in a hell of a new gross factor at the end of A New Beginning – there are people out there who wear zombie-skin suits.